Lemon trees can be potted for indoor or outdoor use, and they can be used in landscapes or in groves for the commercial production of fruit. No matter where a lemon tree is planted, there are several things that can harm a lemon tree. Excess or not enough water can severely damage a plant, turning its leaves yellow. Pests and diseases can destroy entire groves of citrus trees. Lack of nutrients can also cause yellow leaves and poor fruiting on lemon trees. Too much or not enough sun and poor weather can also adversely affect lemon trees. One common reason for yellow leaves on a lemon tree is over-watering. Instead of watering lemon trees every day, consider giving the tree a thorough watering once per week. One way to check for over-watering is to look at the roots. If they are dark with ends that are thinned out, they are suffering from over-watering. Spindly roots will show not enough water, and can also cause yellowing or browning of leaves. Drench the tree, but ensure that there is plenty of drainage. Water should come out of the bottom of the pot to ensure the entire root system has received adequate water. If the tree is potted, be sure the tray under the pot is emptied and there is no standing water left in the tray or pot. Wait until the soil is dry down at least 2 or 3 inches before watering again. Misting the leaves between watering is an option and also will keep bugs away. A buildup of salt can cause lemon trees to have yellow leaves. In addition, not enough nitrogen, magnesium, or manganese and calcium can cause yellowing leaves. If the leaves are yellow, but not drooping, the nutrient deficiency may be the cause. Be careful when putting Epsom salt in the tree. Although the plant may need it, too much can cause damage. In addition, using a balanced fertilizer will reestablish these nutrient levels. Test the soil with a pH tester, an electrical conductance meter, and a nutrient tester to determine if the yellowed leaves may be the result of too many or not enough minerals. Excess minerals and salt can be eliminated by drenching the tree several times, and allowing the excess water to drain out of the pot. Watering and minerals are the most common reasons for yellowing lemon tree leaves, but too much sun can also burn the leaves on lemon trees. Excessively hot temperatures also can burn leaves and turn them yellow. Watering the lemon tree a bit more during hot, dry times can improve the lemon tree’s leaf color. Citrus trees do not like cold weather. If a frost or sudden freeze occurs after the tree has leaves, this could be a reason for yellowing. Lemon trees can be damaged badly when temperatures drop below 20 degrees Fahrenheit, and fruit and flowers can be damaged when temperatures are lower than 28 degrees Fahrenheit. Lemon trees are also attacked by many diseases. Some of these diseases include green, blue, and pink mold; root, heart, and wood rot; crinkly leaf; damping off; leaf spot; branch knot; scab; anthracnose; greasy spot; gummosis; and red algae. Each of these diseases has separate characteristics but can attack any lemon tree. 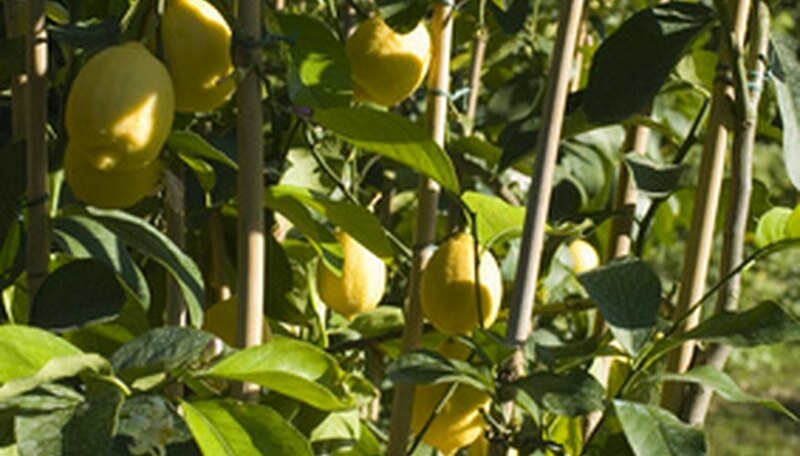 Pests such as rust and purple mites, purple scale, and red scale can also affect lemon trees.